Today we released YaCy 1.2. This is a major change in the architecture of YaCy since Search functions now use primary Solr as indexing engine instead our Peer-to-Peer optimized distributed indexing algorithms. This step also means that YaCy gives up the attempt to create it’s own indexing technology in favor of the much more advanced Solr/Lucene library. A Host Browser to explore the file structure of crawled hosts: this shows loaded pages, pages with errors and pending files in the same way as a file browser would show the content of a host. We believe that the new features are also valuable for Web Administration and Search Engine Optimization (i.e. to find dead links etc). 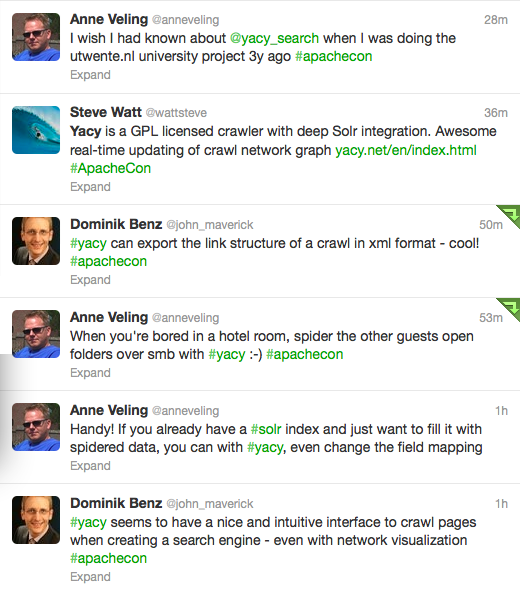 Please have a look to the screen shots at the YaCy ApacheCon 2012 Talk Slides. YaCy is available as Windows, Mac and debian package and also as tarball. To download YaCy, visit the YaCy Home Page. Use Solr, but don�t home-brew your own code around it if you do web-, file- or intranet-search, it�s all inside YaCy. And don�t buy a commercial appliance, this is free and better! This entry was posted on Donnerstag, November 8th, 2012 at 9:52 pm and is filed under Uncategorized. You can follow any responses to this entry through the RSS 2.0 feed. You can leave a response, or trackback from your own site. Now whats the default ? Solr or P2P Based search or does Solr now work in P2P mode using yacy ? Solr is always used in both modes, P2P search and portal-mode/intranet search. There is no question about Solr being default or not because this is now the core of the search index in YaCy. But P2P search is active by default if you start YaCy. You can switch to portal mode with just one click.